The Young Lasallians team spend much of their time on the road, passionate and devoted to engaging schools in a variety of diverse programs under the Lasallian tradition. 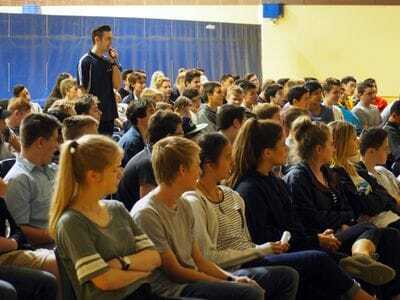 Today, the Youth Ministers held a Reflection Day for over 100 year 9 students from Oakhill College, Castle Hill. Helping to facilitate the range of activities and group discussions were two recent Oakhill graduates and Oakhill year 11 students, who were all instrumental in assisting the Lasallian Mission team to enable group discussions and help mentor their younger peers. The Young Lasallian team offers opportunities for young people to discover the fullness of life through innovative experiences of faith, service, and community. It also provides students an opportunity to get together and think as an individual, and as one community. If you haven't seen the team in action, be prepared to be impressed. You really are in for a treat. The team are available to facilitate retreats from 1-3 days either at your school or off-site. Themes can be tailored to fit your student year level, desired theme, and context. Each day provides a unique experience for all participants to contemplate their lives through the Lasallian Catholic tradition. Facilitating the Oakhill College Retreat: Amanda Proulx as Assistant Director of Formation for Young Lasallians. Jordan Bottalico, Assistant Lasallian Youth Ministry Coordinator. Richie Leilua, Oakhill College, Castle Hill, NSW is a graduate from De La Salle College, Mangere East (2003). Since graduating, he has remained a man of service through his strong connections in his local church as the chairperson for the South Auckland Catholic Youth Groups. Elias Bounader, Holy Spirit Catholic Spirit Catholic College, Lakemba Elias is himself a proud graduate of Holy Spirit College from the Class of 2014 and he sees youth ministry as a valuable way of contributing back to his old school. Please contact Amanda Proulx, Assistant Director of Formation for Young Lasallians.